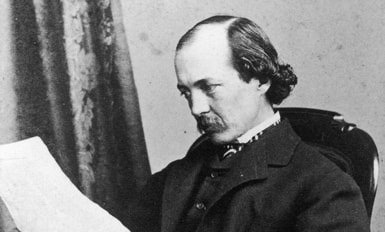 Olmsted was a restless person, continually trying on new roles. He first made his mark in journalism, publishing his observations of life in the South after three tours through the region in 1850s.2 He offered a scathing depiction of slavery, the resistance of southern society to change, and the degrading effects of the institution on society as a whole. Olmsted became an abolitionist when that was still a minority position, and a reformer throughout his life. At the outbreak of the Civil War, Olmsted’s superintendence of the Central Park project was limited due to disputes with the city, and he contacted Henry W. Bellows, a New York Unitarian minister, for help in securing a position. Bellows drafted him to head up, as executive secretary, a newly chartered private institution, the U.S. Sanitary Commission, of which Bellows was a founding Commissioner. Broadly modeled on the British example in the Crimean War, the Sanitary Commission addressed two persistent needs in the delivery of medical services in wartime. The first was that the standing army of the United States was relatively minuscule, and its medical department equally so. At the outbreak of the war, the army had some 16,000 men at arms, a portion of whom defected to the Southern cause. Through volunteers and conscription, the number of men serving eventually reached 2.5 million over the four years of the war, with perhaps half a million in uniform at the height of the conflict. As the volunteer army geared up so did the medical corps, but by any measure the medical service of the army was largely inadequate for the task. And the medicine of the army seemed inadequate as well. The Sanitary Commission as he organized it had a paid professional staff and a corps of medical inspectors to review military camp conditions and advise military physicians. The inspectors also relayed requests for supplies back to the Commission’s offices in Washington, where central office staff would work to fill requests from donations. “The Sanitary Commission used the side-wheel steamboat Wilson Small as its headquarters for much of the Peninsula campaign.” Olmsted Papers, 4:331, n1. 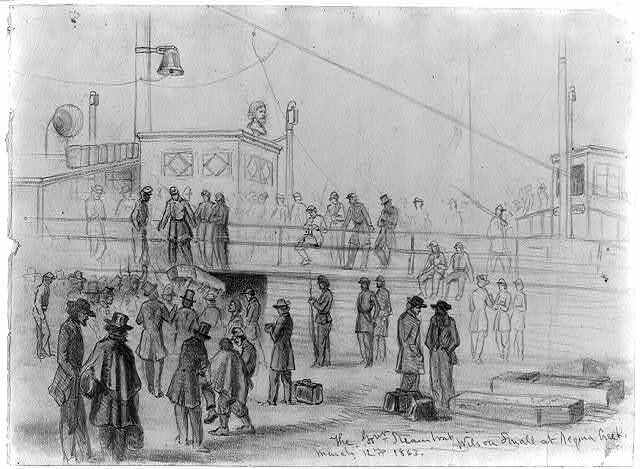 This drawing, from the collections of the Library of Congress, portrays the ship at harbor in Aquia Creek, Virginia, March 12, 1863. 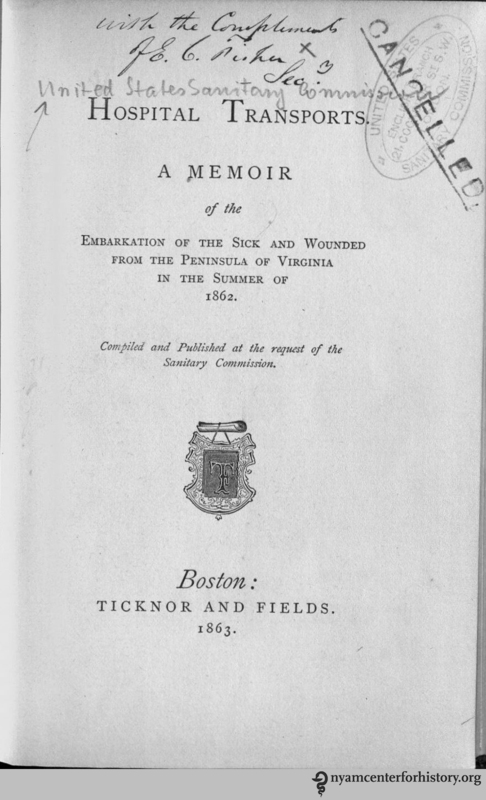 Title page of Olmsted’s Hospital Transports, 1863. Our copy is inscribed by Edmund Crisp Fisher, secretary of the English branch of the U.S. Sanitary Commission, whose cancelled stamp is also on the page. 1. I acknowledge the excellent introduction to The Papers of Frederick Law Olmsted, Volume 4: Defending the Union: The Civil War and the U.S. Sanitary Commission, 1861–1863, ed. Jane Turner Censer, with Charles Capon McLaughlin, editor in chief, and Charles E. Beveridge, series editor (The John Hopkins University Press, 1986), pp. 1–69, which is a major source for this account. 2. Olmsted published his accounts as A Journey in the Seaboard Slave States, with Remarks on Their Economy (1856), A Journey Through Texas (1857) and A Journey in the Back Country (1860) and then reissued them as a two-volume work titled The Cotton Kingdom: A Traveller’s Observations on Cotton and Slavery in the American Slaves States (1861). 4. A copy is available online, and the book has been recently edited by Laura L. Behling and re-released. 5. There are many excellent books on Frederick Law Olmsted: for further reading, consider Witold Rybczynski, A Clearing in the Distance: Frederick Law Olmsted and America in the 19th Century (1999), and Justin Martin, Genius of Place: The Life of Frederick Law Olmsted (2012). This entry was posted in Collections, History of medicine and tagged civil war, civil war medicine, Frederick Law Olmsted, Sanitary Commission by nyamhistorymed. Bookmark the permalink. Did F.L. Olmsted ever cross paths with Clara Barton?